When it comes to working with anyone in a sales capacity, consumers tend to have hesitations. They immediately go on the defensive and worry about being taken advantage of, scammed, or left in a situation they can’t escape. Unfortunately, this can often be true when it comes to real estate. Buying and selling a home is such a personal process tied to such a large investment that it is crucial that your clients know they can trust you as their agent. While you might know how experienced and trustworthy you are, it’s part of your job as a real estate agent to put the minds of your prospects and clients at ease and demonstrate your trustworthiness. What exactly do your clients need to experience from you to be sure you’re the right agent for them? When you’re building a relationship with someone new, especially when it comes to something as personal as purchasing or selling a home, so many hesitations can be cleared up for the client if they know all the steps in the process from the beginning. In this case, a lot of back and forth can prove fruitful. Explain exactly how you will go about pricing their home or finding the best property for them. Ask them what their fears or pain points are. Discuss their options. Make a serious effort to understand exactly what they need, or any roadblocks that might arise for them during the process. Collecting that knowledge and storing it (and managing it) within your own database will make communicating with clients that much easier. An agent that walks a prospect or client through all the steps in the process will help them to relax and trust that they are in good hands. Part of building trust with your clients is following through with all those promises you made while you were working to gain their business. How many open houses did you assure them you would execute? What marketing efforts did you discuss when promising them you would sell their house fast? What steps did you tell them you would take to be sure their home was priced to sell? When you’re in a fragile new relationship with a client, any slip-ups on promises you made early on will be a huge red flag for them during the sales process. Clients will immediately question their choice to work with you, so make sure your clients can rely on you by keeping all those important details in a handy place like a real estate CRM to reference throughout the relationship. Nothing offers proof of fulfilled promises quite like some good, relevant data. For those clients who you either just started working with or are discussing a potential relationship with, let your stats do the talking for you. What is the average amount of time your listings have been on the market? How many homes have you sold this year? Do you work primarily in their market? How close did you get to list price for the majority of your property sales? 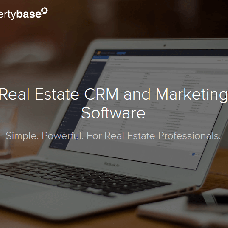 Having a CRM with real estate-specific features to go along with easy-to-use reporting dashboards is critical to your growth as an agent. After all, numbers don’t lie. Real estate professionals choose technology and automation.